I am not receiving any compensation for this post. This book review is based on my opinion and personal experience. I have thoroughly enjoyed sharing the concepts from the book Getting Things Done: The Art of Stress-Free Productivity by David Allen. The previous 3 parts of this series, Mastering Workflow, From Inbox To Next Action, and Reviewing Your Process have been well received. Here is Part 4: The Endgame. “We COLLECT things that command our attention; PROCESS what they mean and what to do about them; and ORGANIZE the results, which we REVIEW as options for what we choose to DO,” writes Allen. 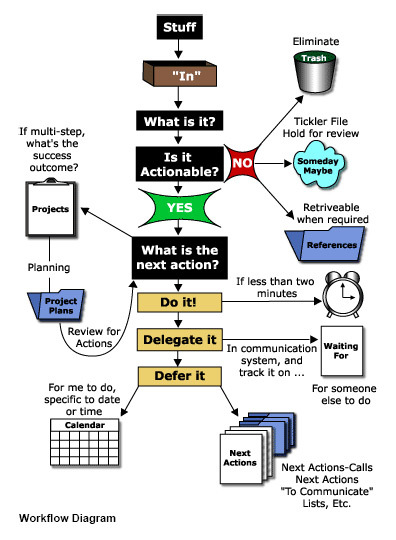 The workflow diagram below shows how we should process all items that we collect. A piece of paper, an e-mail, a voice mail, a package, etc. Everything that we receive. Collect, process, and organize all of your inbox items. Afterwards, they should all be in one of the main groupings represented on the outer ring of the diagram above as described in From Inbox To Next Action. Do a daily and/or weekly review as described in Reviewing Your Process for your main groupings and new inbox items. All the tools we need to get things done have been discussed. But what happens when you get in a rut, get behind, feel overwhelmed? Context: What can you possibly do where you are with the tools you have? Time available: If you have an appointment in ten minutes, you will more than likely choose an action that is different from one if you had a couple of hours to spare. If that is the case, short action items can be crossed off your list during this “weird little time” window. Energy available: When I’m in a low energy state, I pull paper and articles from my Read & Review pile which is in my Waiting For bin. Or I do next action steps that I know don’t require a lot of effort. My high energy state is shortly after I wake up or late at night. That’s when I go for the things that I have put off constantly, items that are my least favorite, or items that require a lot of thinking. Priority: “It is impossible to feel good about your choices unless you are clear about what your work really is,” writes Allen. When you feel like everything is a priority, review your calendar. Ask yourself what has to be done today and what are the consequences of not doing your next action items. When is your high energy state? My high energy state is late afternoon/evening, Kimberly. I look at my organizer and mentally make a note (sometimes physically) of what I absolutely must do today. Then I tackle those items and then go on to the medium-urgency items, then the low-urgency ones. But if the phone rings and I can do some of the low-urgency items while I'm phone-bound, I squeeze them in too! I do a lot of things on the phone too, Alison. A couple of my family members who love to talk will dominate the conversation. So I take care of low-urgency things while I say, “yeah”, “OK”, “right!” LOL. Yep I have a few friends and family who are chatterboxes. You could finish reading War and Peace while they talk and they wouldn't even notice! I know exactly what you mean, Michelle! Part of the reason that I post these tips is to keep myself on track. I have been needing to address this for a while and I finally am!! I am working on productivity and efficiency in a big way, for both my blog and my small business. I've gotten to the point where I can't fly by the seat of my pants anymore. I've read that people tend to read e-mails around your low energy time. That's why bloggers see their pageviews go up then.